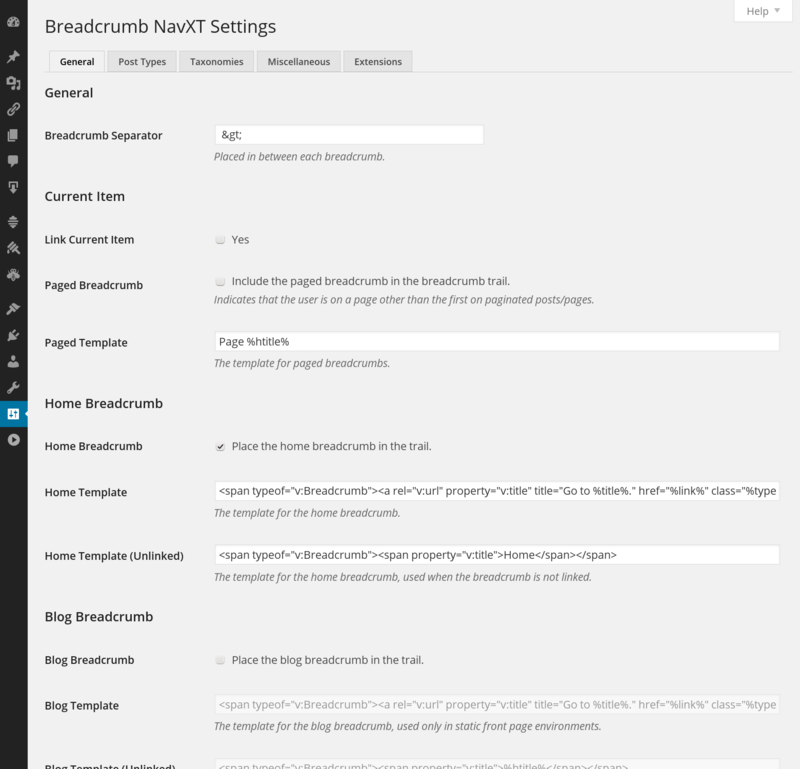 Breadcrumb NavXT is a WordPress plugin compatible with WordPress versions 4.0 and up. This plugin generates locational breadcrumb trails for your WordPress blog. These represent the hierarchy leading up to the current page rather than the actual path taken to arrive at the current page. Breadcrumb trails are a good supplementary navigation system that aid in site usability. This is especially true for sites using WordPress as a CMS. Since Breadcrumb NavXT reveals the page hierarchy in a consistent manner, it can provide SEO benefits. This website runs Breadcrumb NavXT, feel free to browse the various sections to see how Breadcrumb NavXT behaves. BuddyPress compatible (enhanced compatibility with BuddyPress extension plugin). Disable any previous version of this plugin or Breadcrumb Navigation XT. 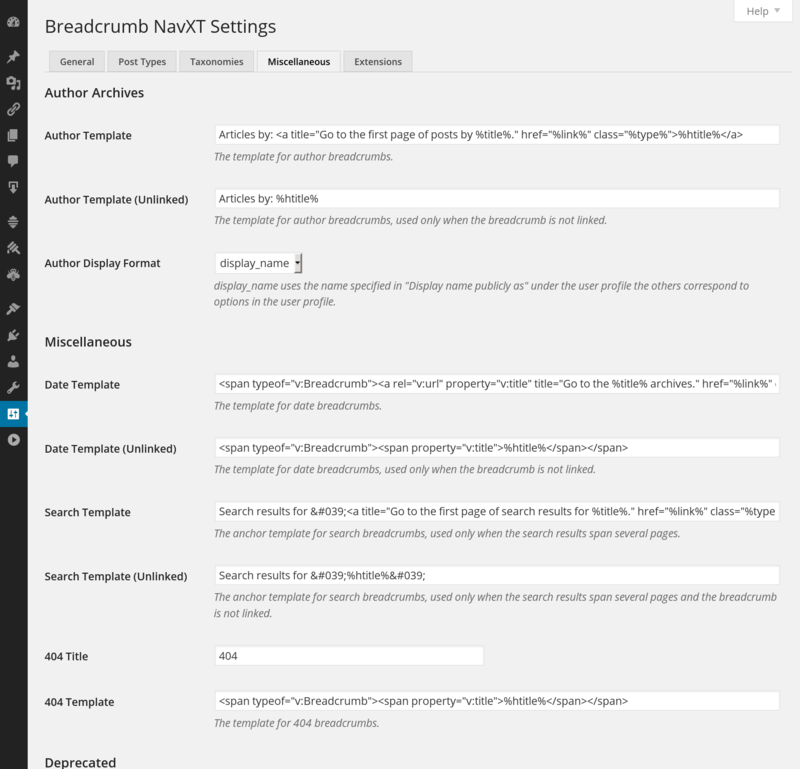 Enable the Breadcrumb NavXT plugin in the administration panel under the Plugins > Installed section. Depending on your theme this section may be unnecessary. If you are using berry as your theme everything is done for you so you have no further steps to take. Open the appropriate file for your theme (typically header.php). This can be done within WordPress’ administration panel through Presentation > Theme Editor or through your favorite text editor. Place the following code where you want the breadcrumb trail to appear. Save the file (upload if applicable). Now you should have a breadcrumb trail on your WordPress powered site. To customize the breadcrumb trail you may edit the default values for the options in the administrative interface. 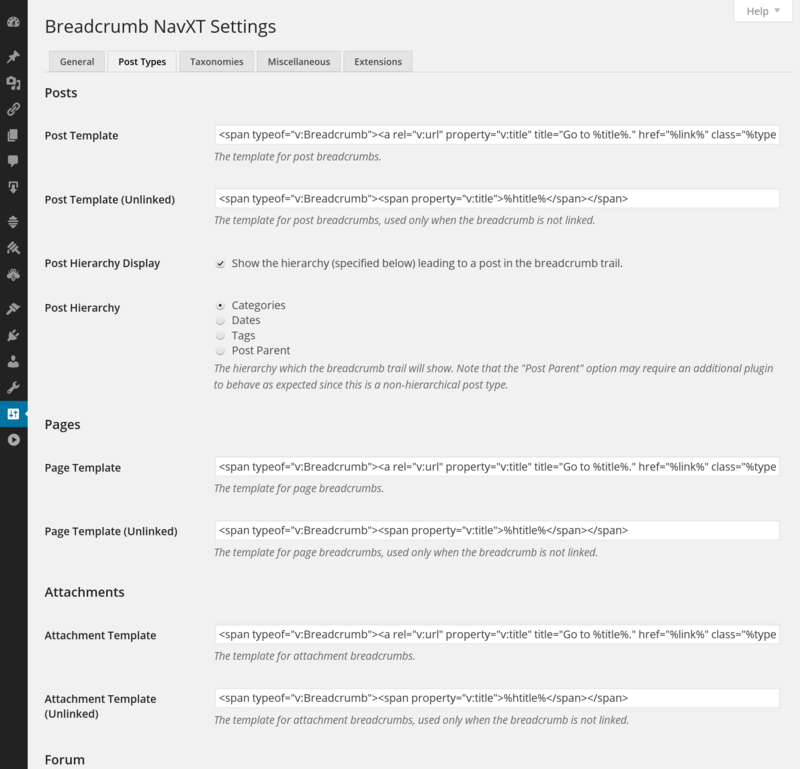 This is located in your administration panel under Settings > Breadcrumb NavXT. Breadcrumb NavXT’s functionality can be augmented with free and premium Add On Extensions. 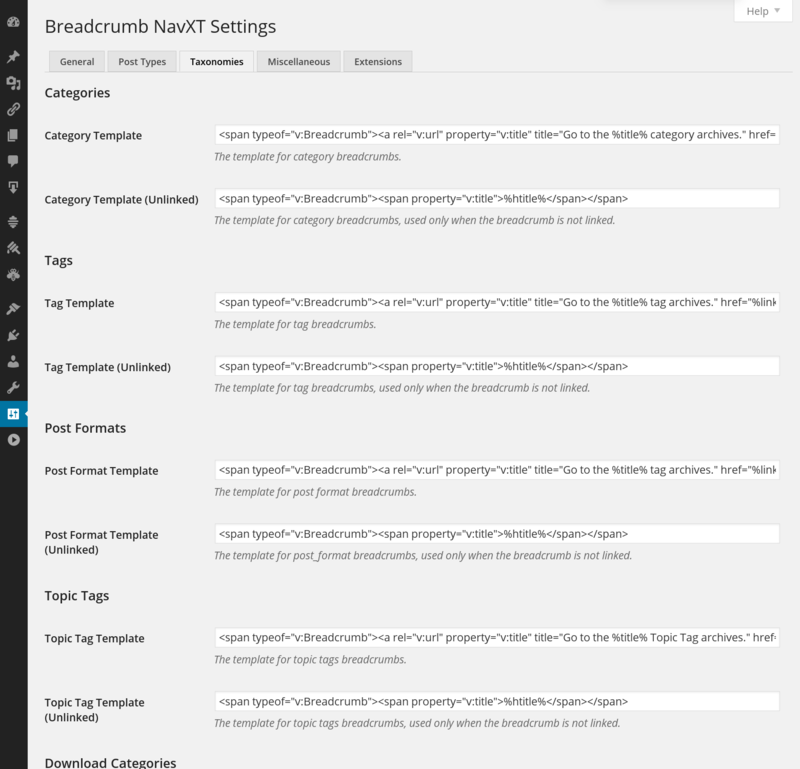 Visit the Breadcrumb NavXT Extensions Store to view all available extensions. New feature: Added Gutenberg block for displaying breadcrumb trails. New feature: Added bcn_display_attribute_array filter. New feature: Added bcn-aria-current template tag to facilitate WAI-ARIA Breadcrumb support. Bug Fix: Updated settings page to follow WP core standards for header structure. Bug Fix: Updated checkbox in adminKit to eliminate multiple labels to follow WCAG 2.0. Bug Fix: Fixed PHP error in circumstances of bcn_breadcrumb_trail::fill() falling back on treating an unknown item as a taxonomy. To keep this page at a reasonable length, only versions 6.0 and newer are present in this changelog. For the entire changelog, including versions of Breadcrumb Navigation XT, visit the Breadcrumb NavXT Changelog page. Breadcrumb NavXT is released under the GNU GPL 2.0 license and comes with absolutely no warranty. By downloading Breadcrumb NavXT you agree to the terms of the GNU GPL 2.0 license. Hi. How can I edit the style of text and margin ? Thank you. I am trying your plugin by adding the breadcrumb in my single.php tp show category taxonomy. I am using categories that go 4-5 levels deep however the breadcrumbs only include the top 2. e.g I only see “home > cat 1 > cat 2 > post”. Cat 3+ are not shown. Is there a switch to increase this? Breadcrumb NavXT will pick the first hierarchical category structure it can find for a post, this may or may not be the deepest category hierarchy for that post. It is considered a best practice to not explicitly set a post to be a member of two categories within the same hierarchy (e.g. one that is a parent/grand parent/ great grand parent/etc or child/grand child/great grand chilt/etc). Breadcrumb NavXT has no limit to the depth of a category hierarchy that it will follow, and my testbed does test a 4 level deep hierarchy. I just double checked and the latest Breadcrumb NavXT behaves as expected in this case. One thing you should look into is ensuring that in your example, “post” isn’t explicitly set as a member of “cat 2” and “cat 4”, keep it an explicit member of only the deepest category as it automatically becomes a implicit member of the other categories. I wholeheartedly second practically everyone on the great utility of this plug-in. Thanks so much! I’m using WordPress as a CMS for a website I’m developing, in which I’ve implemented a dropdown menu. Functionally, the menu headers are pages which serve as the parent for the actual content pages, but the menu header pages themselves are not accessible through the dropdown and lack content. Using your breadcrumb plug-in, however, these pages are linked back to, and I’m wondering whether it is possible to delink these altogether. Example: Home > Resources > Bibliography. In this hierarchy, Home is an actual page that should be linked, but the Resources page only exists for the purposes of the dropdown menu. In the architecture of my site, the second item in the hierarchy (following Home) will always be one of these placeholder pages for the dropdown. I’m wondering whether it is possible to make it so that every single second item will by default not be linked. While doing this is possible, it isn’t easy. I would suggest not having placeholder/blank pages. If you are going to create them, treat them like archives, and link to all the child pages. This is especially necessary if you are using hover/dropdown navigation menus for users of touchscreen devices (tablets and phones) as they do not support the hover gesture very well. If you really want to remove it, you’ll have to remove that breadcrumb from the trail after the trail has been filled, but before the output is assembled (look at the ‘bcn_after_fill’ action). Figuring out what breadcrumb you want to remove may not be very straight forward (the trail under normal circumstances is a stack/LIFO data structure). I’m using your breadcrumb plugin in my footer. For some reason the last thing it always points to is ‘page 1’. However, when I put it in the header it does not do this. how could I make it not display ‘page 1’ in the breadcrumb trail considering my application? You can view this at http://www.cwws.org. okay, nevermind! i figured out what to do by reviewing this thread. unclick the paged breadcrumb option! I’ts a great plugin. I was wondering if there is any shortcode that I could use directly in the page. Since a shortcode would have to be entered in the post content for every post/page, it really isn’t a great solution. It is better to place the calling code in your theme, and just remember to do this every time you change themes (which on a typical site is not that often). Something like this wouldn’t make it into the plugin itself, but may appear as an extension plugin at some future date. Just place that text before the calling code. There is no option for this as it is simple enough to do without an option.